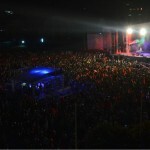 Aerial shot of The Click Five at Phnom Penh stadium lastnight. The Click Five: What the 5 minutes are like before playing for 40,000 people. 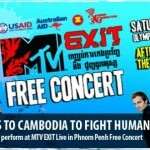 The free concert is organised by MTV EXIT to raise awareness and help prevent human trafficking and exploitation. MTV Exit are holding a video contest on Vimeo to inspire people to get involved with raising awareness and prevention of human trafficking. Using The Click Five‘s track as inspiration, video makers are encouraged to upload their own short film, documentary, PSA or animation that raises awareness of the issue. There’s been some impressive videos submitted so far! Deadline for entries is May 21st. looking forward to their review of the album. The Click Five have partnered with MTV EXIT to produce a music video to their track “Don’t Let Me Go”, from their upcoming album TCV. MTV Exit is a campaign to raise awareness & increase prevention of human trafficking in Europe and Asia. “Don’t Let Me Go” is available as a free download HERE.